FROM THAT YOU'LL GATHER that this fifth-generation Micra is the cat's whiskers. And you'd be right. This new Micra is indeed dazzlingly different from any of its predecessors; it's as though Cinderella's fairy godmother has waved her magic wand and Zap! there's this cool 'I want one' hatchback. Believe in happy endings because with the all-new Micra, you're looking at one. It's so completely different to its predecessor that this new Micra merits a new name  it only comes in a five-door hatch body but with the door handles concealed in the C-pillars and a 'floating' roof it looks low and lithe; more swoopy sports coupe than supermini hatch. Sharp styling crease lines run from the profiled arrow-shaped bonnet over the front wings, dipping then rising to rear lights that sit proud of the bodywork at each rear corner. Two-tone black and orange alloy wheels add to the eye-candy. feels good to the touch. Beneath the bonnet can be any one of three engines. Choice number one is the best-selling 0.9-litre three-cylinder turbo petrol unit that puts out a healthy 88bhp; the alternatives are another petrol-drinker, a 1.0-litre 70bhp normally-aspirated three-pot, and a 88bhp 1.5 four-cylinder turbodiesel. All are partnered by slick five-speed manual gearboxes. Trim choices number five: all familiar Nissan-brand specifications starting with Visia, running up through Visia+, Acenta and N-Connecta to the flagship Tekna. Personalisation options start with the no-cost one of a two-tone interior  every new Micra has one and there are three variations depending on which trim you go for. The décor is both premium and snazzy, with smart black, orange and grey fabric upholstery that feels good to the touch. The flat-bottomed multifunction wheel looks sporty and the driving position is first-rate, with clear views over the bonnet for accurate placing and easy manoeuvring. There's a fist of headroom, comfortable shoulder room and the seats are supportive on long trips thanks to decent built-in lumbar and light but effective bolstering. Also liked is the keyless entry and starting. Just settle in your seat, press the engine start button and select first  the gearknob is comfortably close to your left hand  and when you let out the clutch you'll appreciate the well-weighted pedals that help make light work of city traffic. Along with ten vivid body colours there are more than 100 possible personalisation combinations, enabling every owner to make their Micra well and truly their own. 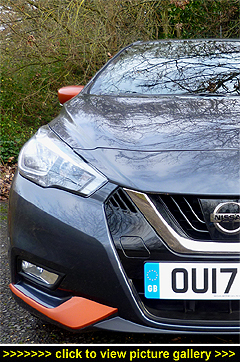 Our press car came with a really swish fascia with an orange padded leather-effect finish with 'touch me again' appeal. Build quality is in keeping with the classy ambiance and centre-dash you'll find a 7-inch NissanConnect touchscreen entertainment and navigation system with app integration. The navigation is foolproof to use; the 3D mapping and straightforward prompts will get you where you're going without a single U-turns. Set between the two main dials is a five-inch colour display that shows loads of trip and driving information, the most important being your road speed and, above it, the posted speed limit. So, no excuse for going over! Plus the automatic air-conditioning is efficient, the powerfolding heated door mirrors (on demand and automatically on leaving) handy, and the driver gets a one-shot-op electric window. Smartphone mirroring is child's play using Apple CarPlay and there's a DAB digital radio with CD slot, Bluetooth, AUX socket and USB port with iPod connection. And something else that will be music to your ears  a unique-to-the-Micra Bose Personal audio pack with innovative speakers built into the driver's headrest. This Bose system has just been voted Number One in the 'Entertainment Sound' category at the annual 'Connected Car' awards that highlight the best new technology from the world of in-car infotainment. Bose Personal sets a new standard in small car audio and is custom-engineered for the Micra's cabin; two speakers are in the doors, two in the A-pillars and another pair in the driver's headrest. And the broad range of speaker performance means no boot-space-stealing sub-woofer is necessary to create bass sounds. The speakers work in tandem with Bose's Personal Space Virtual Audio Technology  a pioneering digital signal processing system which creates a vivid and rich 360-degree listening experience even at higher volumes. The Micra driver can select his or her personal level of audio immersion via the infotainment system. Believe it when we tell you that you won't hear it better in any other car of this size! When you need to park there's a suite of parking sensors and multi-view cameras providing a 360-degree surround view, so no visual restrictions from the privacy rear window and tailgate glass when going backwards. Often overlooked in smaller cars is in-cabin storage space  but the Micra comes up trumps here too with a real-world glovebox, three large dual-usage cupholders in the centre console, bottle-holding door bins, and a storage 'cave' at the base of the centre stack with a modish blue-underlit mat where your smartphone can chill out. Less than a thousand cubic centimetres (actually just point nine of a litre) isn't going to win any drag races but even so it's enough to get the Micra off the blocks and past 62mph in 12.1 seconds  and on to a 109mph top speed, so you can flow with the motorway traffic as easily as anybody else. Backing up the lightweight triple's 88bhp is 103lb ft of torque put down through the front wheels, and as it's pulling a light car it's ample for responsive town driving as well as keeping it lively out on the open roads, where you'll find surprisingly good pick up in the higher gears. Cruising at the legal limit, wind and tyre noise are well suppressed so it's even more impressive that the 0.9-litre engine is hard to hear. That said, when asked, this refined three-pot is willing to pull all the way to the redline. The five-speed manual gearbox has a nicely-weighted gearchange action, which makes it a pleasure to spend all the time you want in the rev-band's sweet-spot when making the most of that 88bhp. It's also pretty frugal. Its official Combined Cycle figure is 61.4mpg and although a hard week's testing saw 47.9mpg recorded (we certainly wouldn't complain about that), regular drivers will no doubt be breaking through to the sunny side of 50mpg on a regular basis. Getting the handling:ride balance right on a small car can sometimes be a mission impossible  but in the Micra's case Nissan's engineers have chalked up a mission accomplished. For a start there's plenty of technical 'assists' working in the background to keep things shipshape, starting with Intelligent Trace Control and Intelligent Ride Control. Both operate so subtly that you really don't know when they're acting on your behalf. Trace Control works by applying braking to the most appropriate wheel to adjust grip and keep the Micra on track through corners while Ride Control helps to smooth out the intrusive effect of larger ridges and speed humps. In practice, this Micra stays honest to your line even over camber changes and bumpy blacktop. The Micra is set up to be secure but there's agility there too: the steering is accurate and well-weighted, roll angles are kept in check, and grip's good; all of which combine to make enthusiastic cornering something you can safely indulge in. The brakes too are nicely judged and will kill your speed without drama. And, unlike 007's trademark cocktail, you won't be shaken when you're being stirred  even rolling on 17-inch alloys the ride is generally smooth and good-natured. Safety-wise you couldn't really ask for more: standard-fit is autonomous emergency braking with pedestrian recognition  a 'first' in the Micra's class. Also included is Lane Departure Warning and Intelligent Lane Intervention that will steer you back into your lane should you stray, traffic sign recognition, high beam assist, speed limiter, cruise control, tyre pressure monitoring, auto lights, rain-sensing wipers, height-adjustable front seatbelts, Isofix child seat anchorage points (two rear and the front passenger seat), six airbags, and LED signature daytime running lights. Okay, so Cinders wouldn't get in the back wearing her ball gown but normally-attired people will. For them, getting in and out is easy. But not everyone will be using the rear seats all the time. This new Micra will appeal strongly to younger couples with a sense of style and even empty-nesters, but even so travelling in the back is pleasant and there's ample space for installing a child seat and the child that goes with it! The wind-up rear windows do a perfectly fine job of letting in fresh air and you sit higher than those in front so there's not as much headroom but it's still okay for adults; youngsters will be fine. Foot room is good and knees are well clear of the front seatbacks, plus the backrests are set at a relaxing angle and the seat well padded  both what you sit on and what you lean against. And Yes, a third in the middle is doable. It's an airy spot, despite the dark tinted side windows, and a pleasant place to ride even if you weren't quick enough to bag the front passenger seat. For those needing to carry luggage the 300-litre boot should prove more than adequate, and on the odd occasion you want to transport something larger the 60:40-split rear seatbacks can be folded down to open up a 1,004-litre loadbay. The parcel shelf luggage cover is quickly removed (literally in seconds) and although there is a drop down over the rear boot sill it's not a problem as you're hardly likely to want to shove a fridge-freezer in there!